Maricopa County Sheriff Joe Arpaio announces newly launched program aimed at providing security around schools in Anthem, Arizona, January 9, 2013. 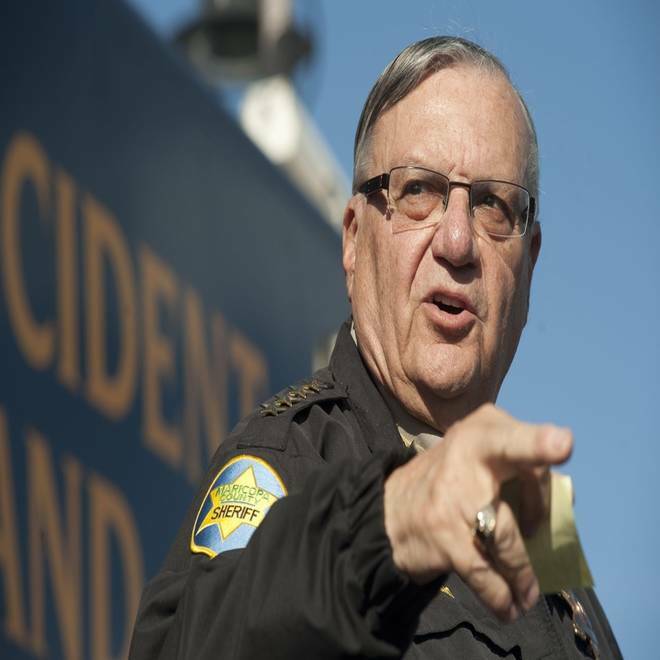 PHOENIX — Tough-talking Arizona Sheriff Joe Arpaio is warning civilians who embark on armed patrols in remote desert terrain that they could end up with "30 rounds fired into" them by one of his deputies. His unapologetically terse comments came Tuesday after a member of an Arizona Minuteman border-watch movement was arrested over the weekend for pointing a rifle at a Maricopa County sheriff's deputy he apparently mistook for a drug smuggler. "If they continue this there could be some dead militia out there," Arpaio said. Richard Malley, 49, was heavily armed with two others dressed in camouflage Saturday night along Interstate 8 near Gila Bend, a known drug-trafficking corridor in the desert about 70 miles southwest of Phoenix, when he confronted the deputy who was on patrol conducting surveillance, authorities said. According to court records, the deputy and his partner stopped their vehicle, then flashed their headlights and honked their horn, a common practice used by law enforcement to trick drug smugglers into thinking the car is there to transfer their narcotics load and lure them out of hiding. The deputies then got out, also dressed in camouflage but clearly marked with sheriff's patches on their clothing, and began to track what appeared to be fresh footprints, authorities said. That's when Malley emerged from the darkness with his rifle raised "yelling commands," according to the probable cause statement. The deputy, illuminated by Malley's flashlight at this point, identified himself as law enforcement, pointing out the "word sheriff across his chest," and ordered Malley to drop his weapon. "You aren't taking my weapons," replied Malley, who was armed with a semi-automatic rifle, a .45 caliber handgun and a knife, according to court records. Another deputy eventually arrived and arrested Malley for aggravated assault. He was released on $10,000 bail and is set for a court appearance on Aug. 26. It wasn't clear if Malley had an attorney, and telephone numbers listed for him were disconnected. Malley claimed "he had the right to point his rifle at the individual because he had reasonable suspicion to believe a crime was occurring," according to the probable cause statement. He identified himself as a "militia Minuteman." Such Minuteman-type militias of armed civilians patrolling the deserts for illegal border crossers and smugglers grew to prominence in the early 2000s, but the organizations' numbers have since dwindled as they fractured into multiple splinter groups, such as crews like Malley's who were on patrol with just three armed men. Arpaio, whose county doesn't run along the border but has seen an increase in drug and human trafficking, warned there will be "chaos if you're going to have private citizens dressed just like our deputies taking the law into their own hands." "I have to commend my deputy for not killing this person, which easily could have happened," Arpaio said. "He's lucky he didn't see 30 rounds fired into him." U.S. Customs and Border Protection spokesman Andy Adame also expressed concern for the safety of both the militia members and Border Patrol agents. Adame said the civilian groups could easily trigger remote sensors operated by Border Patrol to detect illegal crossers. "And we respond to them in a manner where we expect to encounter illegal immigrants or drug traffickers," he said. "We can encounter them (militia members) out in the middle of the desert, which may result in disastrous personal and public safety consequences." In short, he noted, someone could get shot and killed, either an agent or a civilian. Glenn Spencer, president of American Border Patrol, a civilian group which operates from a ranch along the Mexican border in southern Arizona, won't condemn the actions of private armed militia organizations, but he also doesn't recommend it. "It's a free country. They're not violating any law. They're not trespassing," said Spencer, whose group uses technology, including sensors and unmanned aircraft rather than boots on the ground to monitor the border. "But I wouldn't do it, and I wouldn't encourage anyone to do it," Spencer added. "Going out there is dangerous."